Gardening for the Chesapeake might conjure an image of oyster gardening— tiny spat lovingly planted on shell in semi-strategically located underwater reef gardens. (It’s actually animal husbandry, but oyster husbanding sounds weird). Those scrumptious little critters, a keystone species, once filtered the entire Bay in only a few days. Sadly no more, as the population has dwindled. But important as oysters are as aquatic filters, even at their height they were only one piece of the total water-quality puzzle. Another big piece is stormwater, or runoff management, which involves actual, plant-based, on-shore gardening. “Stormwater management has to do with holding water on-site to stop pollution and silting,” says Steve Torgerson, associate at A. Morton Thomas and Associates, an engineering and design firm headquartered in Rockville, Md. “One of the keys is to slow down water; getting water to sink in and filter through the substrata.” That’s where terrestrial plants come in. For thousands of years, the watershed boasted rich native plant communities—majestic sycamores, shrubby pawpaws laden with fruit; lacy, white-bloomed shadblow (also known as serviceberry); graceful native grasses, and much, much more, whose roots clung to the soil and sucked up stormwater, preventing silt and pollutants from entering the tributaries and Bay. Over time, we’ve obliterated these natural buffers. Riparian forests have been felled, broad swathes of land have been cleared for tillage, cities and suburbs have paved over what was once meadow and wildlife habitat. Many wetlands, vital cogs in the system, have been filled in, though some—like the one in Adkins Arboretum, a 400-acre native garden in Tuckahoe State Park in Ridgely, Md.—have been preserved. Plus, natives are a plant-it-and-they-will-come proposition, drawing and sustaining important pollinators and other wildlife. “Natives are a wonderful way to attract wildlife,” Thornton says, “Whether it’s the birds, or small mammals...the quail. 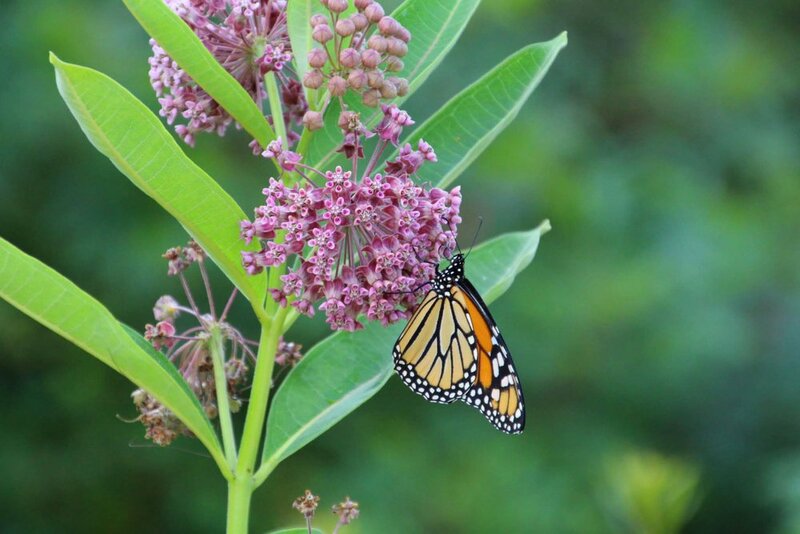 Part of that is planting a variety of types of native plants.” There’s nothing like the magic of an up-close-and-personal view of a Monarch butterfly fluttering on the clustered pink bloom of a common milkweed right outside your door. In addition to the magic, there’s a satisfying sense of virtue. Fertilizing wisely is particularly important. As Chesapeake Bay restoration and preservation movements gained momentum, farmers were censured for excessive nutrient runoff, primarily nitrogen and phosphorous, which produce summer algae blooms and consequential dead zones in the Bay. Since 2001, farmers have filed nutrient management plans, carefully calculating crop fertilizer needs and nutrient uptake. It’s both pennywise and Bay wise. Now much of the Bay’s nutrient overload comes from lawns and turf grass as 44 percent of fertilizer purchased in Maryland goes onto lawns. To address that piece, Maryland implemented the Lawn Fertilizer Law in 2013, which limits the amount of fertilizer that can be applied to lawns or turf. While lawn service companies know they must be licensed to apply fertilizer, many homeowners, unaware of the law and its science-based limits, routinely fertilize their own lawns whether they need to or not. Few have ever had a soil test done. Land use, water quality, animal and human health all connect—something marine biologist and environmentalist Rachel Carson observed in her Conservation in Action series, written in the 1940’s for the U.S. Fish and Wildlife Service. “Wildlife, water, forests, grasslands—all are part of man’s essential environment; the conservation and effective use of one is impossible except as the others are also conserved.” Recognizing this, more and more individuals and organizations are collaborating on a range of shore-side initiatives around the Chesapeake. For example, the Eastern Shore Land Conservancy has joined Envision the Choptank, a program designed to enhance the health and productivity of native oysters in the Choptank River through land stewardship. The program encourages residents to test their soil, install native plants, rain gardens and rain barrels—all of which are right out of the Bay-Wise playbook. Each of these steps, or “inches” in Yardstick parlance, helps diminish pollution and improve water quality. As of last December, there were 2,850 Bay-Wise certified gardens in Maryland, including 238 in Baltimore. While it’s easy to see how to create beautiful and effective buffers on lawn-rich properties, it’s harder in urban concentrations of impervious surfaces—roofs, playgrounds, driveways, roads, alleyways—which sluice all manner of toxic chemistry, to say nothing of trash and the occasional python, into the storm drains and from there into the Bay. But it can be done. Studies have shown that increased tree canopy in urban settings can create ambient cooling effects between three and seven degrees Fahrenheit. “It’s also going to go a long way toward helping us meet our MS4 [municipal storm sewer] goals,” Raymond adds. The projects in Baltimore will cost $10.3 million, a significant chunk. But in addition to the significant but less-easily-measured ambience and encouragement that green spaces offer a community, a well-implemented green plan can also save significant municipal money. Twenty years ago, Portland, Oregon, which gets about 37 inches of rain annually, was threatened with a lawsuit for polluting the Willamette River with combined stormwater and sewer overflow. They began trying to engineer their way out of the problem by upsizing the municipal piping system. When they realized that there was a limit to upsizing, they incorporated a greener approach, including green roofs, green streets, rain gardens, and bioswales, which are broad drainage courses usually planted with a mix of natives and nativars (cultivars of native plants). And, they asked residents to disconnect their downspouts from the storm drain system. This multi-pronged attack considerably diminished the problem and netted approximately $65 million in savings for the municipality. For example, we can’t just plug in a rain garden at every damp corner or downspout. For one thing, a rain garden needs to be at least 10 feet from the house so you don’t flood the basement. But in addition to being functional, it needs to be beautiful. “You have to make these things look attractive, so they are publicly accepted and add to the aesthetics of our community,” says Emily Hauth, a stormwater specialist in Portland’s Sustainable Stormwater Management Program. Native plants lend themselves to a kind of English cottage garden effect rather than a manicured estate look, (though a wide swath of warm season grasses along a shore is distinctly estate-looking). One way to ensure that a mixture of open-form native plantings is perceived as beautiful is a carefully defined perimeter. “People are more willing to look at a kind of messy landscape if it is bound within an orderly frame,” says Nassauer. “If the edge of your landscape is kempt, what you put on the inside can be messier and less trimmed. It still looks to the casual observer that it’s a beautiful landscape.” Nassauer also notes that telling the story of the space is an important component in community appreciation. “Signage,” she says. “An interpretive panel that can tell the story. People need to read and understand.” Which is one function of the Bay-Wise sign. While it doesn’t tell a story so much as advertise a concept, it does offer passers-by something to consider, a heads up about Bay-centric land stewardship and our individual roles in that enterprise, regardless of where we live in the watershed. Chesapeake water quality is not just about oysters and menhaden, or stormwater management, or EIB’s or even Bay-Wise certification. It’s all of that and more. There are lots of interconnected pieces. Yet each piece of the water quality puzzle helps to create the whole beautiful picture. Included in that picture are Bay-conscious buffers and rich, native-filled Chesapeake gardens. Author Nancy Taylor Robson is a sailor and master gardener whose imperfect but productive, critter-filled property is Bay-Wise certified.